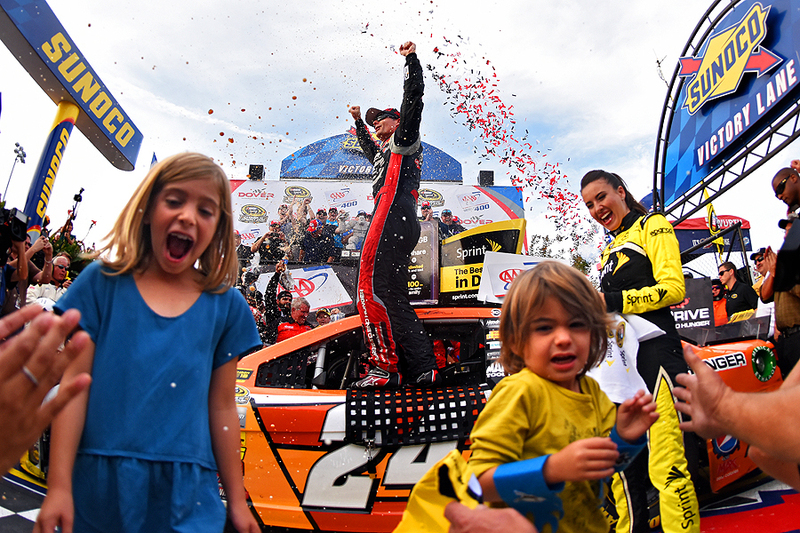 "Jeff Gordon, driver of the #24 Drive To End Hunger Chevrolet, celebrates in Victory Lane, as his children Ella and Leo attempt to dodge the showers of beer, after winning the NASCAR Sprint Cup Series AAA 400 at Dover International Speedway on September 28, 2014 in Dover, Delaware." I often say I aim to please when it comes to assignments - I'll do whatever is asked without question - as any team player should do. During the NASCAR Sprint Cup Series AAA 400 at Dover International Speedway I was placed in victory lane for the celebration. This shot from straight on is normally not the most compelling image, but is necessary for historic and storytelling purposes. However, in a change of plans, my editor told me to shoot from a lower position instead of my guaranteed marked spot from above. This wasn't the original plan, and he stressed that I'd have to work hard to keep my view clear, not be kicked out from that position and shoot with an extremely wide lens. With this type of pressure, I wasn't sure if I'd be completely blocked or not. Fans, supporters and others rushed into the crammed victory lane area seconds before Jeff Gordon jumped from the cockpit to raise his arms. Keeping my composure, I muscled for position and leaned forward and began shooting. To my surprise, Gordon's children had run toward my lens while clicking away, in an attempt to stay dry from the rain of champagne. Everyone's reactions and the layering of the images has made it one of my favorite victory lane images to date.